@shivamishra97, Can you please share what you have done till now? @vinayak.joshi Please help her out. This library reduces the effort required to interface an Arduino to a Bolt module. The library supports hardware as well as software serial UARTs, as such the Bolt can be interfaced to with any pins of the Arduino. But it would be more robust to use hardware UART over software UART. By using this library, any data collected or processed by the Arduino can be sent to the Bolt Cloud. 3. Click on ```Sketch->Include Library->Add .Zip library```. 4. Navigate to the folder where boltiot-arduino-helper-master.zip was downloaded, and select boltiot-arduino-helper-master.zip. 5. Press the 'Choose' button and the library is loaded to your Arduino IDE. While it is a good idea to define the API key and device id as a part of the code, it is sometimes troublesome to write the corresponding code everytime you have a new project. You can define a global API key or device id, by using the following steps. 1. Go to the ```libraries/boltiot-arduino-helper-master/src``` folder inside your sketchbook folder. The sketchbook folder is normally ```My Documents/Arduino``` folder for windows and ```~/Documents/Arduino/``` folder in Mac and Linux. 2. Open the file ```BoltDeviceCredentials.h``` file in a text editor. 3. Uncomment API_KEY or DEVICE_ID or both macros, whichever you want to make common across all examples. 4. Replace the dummy values with actual value for the corresponding macro. 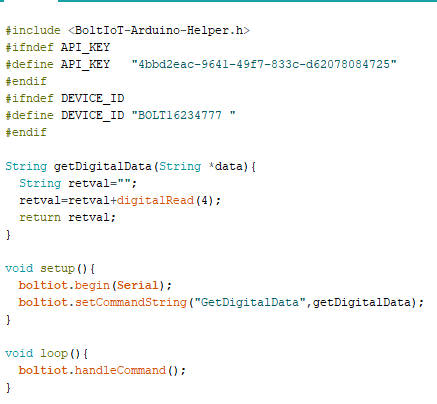 Go through the example codes available via the library to understand how to setup the Arduino to respond to a command from the Bolt. 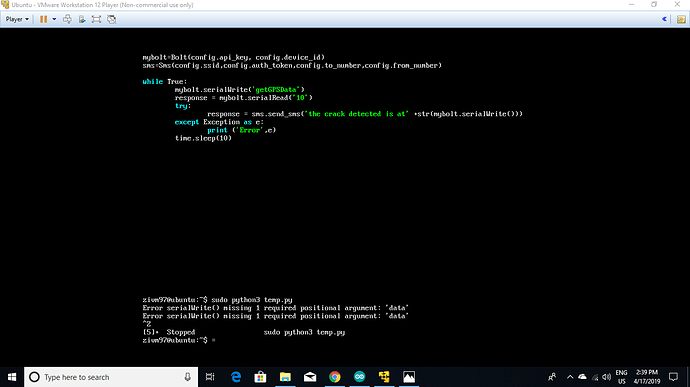 Then in your python code, use the serialWrite command from the BoltIoT python library, to send the command to the Arduino, and then use the serialRead command from the BoltIoT python library to get the response from the Arduino. You can code your Arduino to send the GPS location as the response. 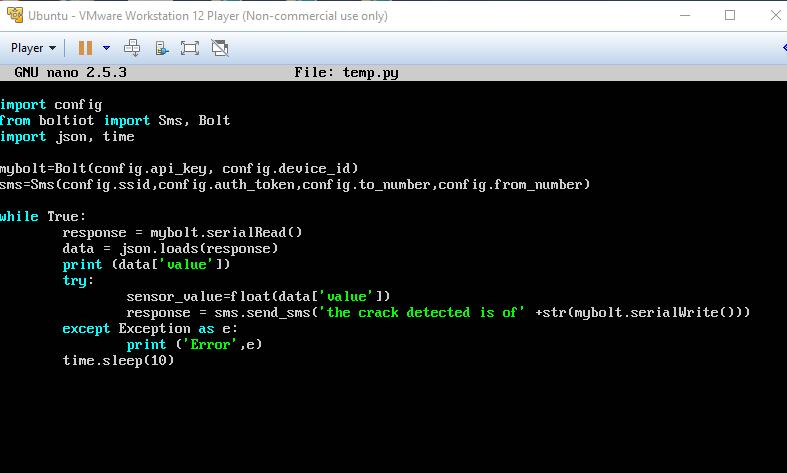 This will allow you to pull the GPS data into your python code, and then send an SMS with the GPS data. @shoeb.ahmed @vinayak.joshi I had installed the library.However in the examples using pushdata command we will send the data to the cloud.But how will i send the data through sms. Should i use the same Vm workstation Program which I had earlier used.Or is there any other way? Also I have connected Gps with arduino using RX tx pins of gps and 3,4 digital pin of arduino.So what pin number should I pass In Pushdatacommand? inorder to send the gps data? @vinayak.joshi @shoeb.ahmed this is the screenshot of the Vmworkstation UBUNTU programming I had earlier did to send Sensor value in the SMS. When I said examples, I meant the examples that get populated in File>Examples>BoltIoT-Arduino-Helper in your Arduino IDE. You will need to go through the code for the “CommandHandler” example. Since you have the GPS device connected to the tx and rx pins of the Arduino, you will have to use 2 other pins of the Arduino to interface the Bolt WiFi module. These can be any two digital IO pins of the Arduino. 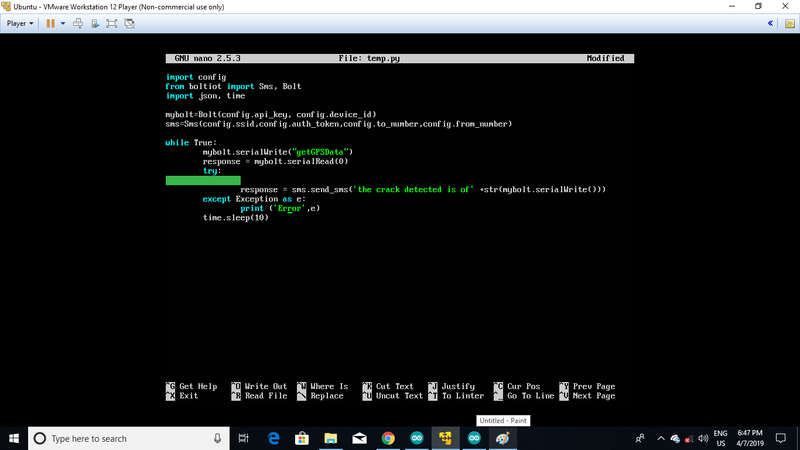 Also in your python code, you will have to use the “serialWrite” and “serialRead” functions instead of the ‘analogRead’ function and you should be able to get the gps data from the Arduino. 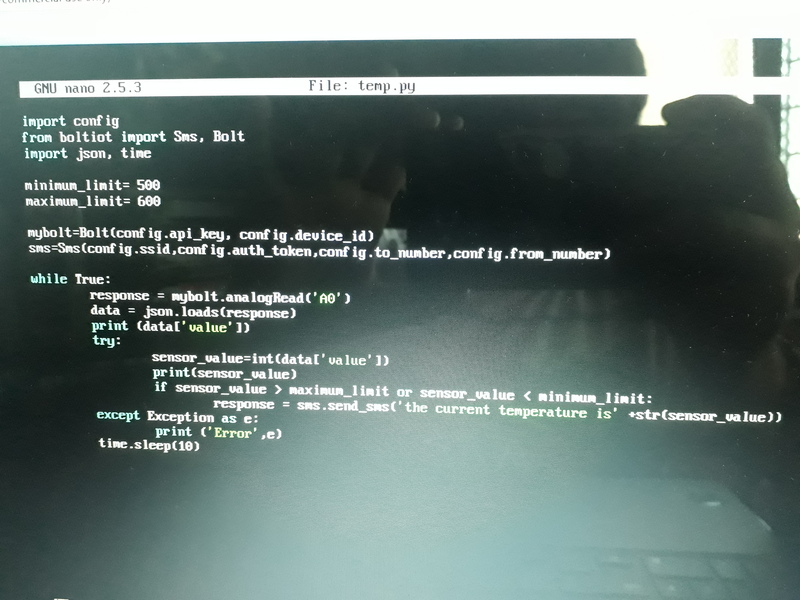 @vinayak.joshi Thank You for your response.I am not able to understand the working of “commandhandler” as there is “getanalogdata” as well as “getdigitaldata” .Also I am only connecting GPS & BOLTIOT to the arduino,so is there any need for analogdata or digitaldata?Can you please explain me the working of the example so that I can implement it according to my project? Or it would be a great help if you send me a sample code stating only the important data(parameters,functions),so that it becomes easy for me to program it.Please help!! @vinayak.joshi I have shared the screenshot of arduino program and pythoncode that i wrote according to my understanding. please check it out.Also I have connected BOLTIOT to Rx Tx pin of arduino and GPS i have connected to tx-pin 4 and Rx -pin 6 of arduino. The commandhandeller is an example code that explains how to use the library to implement a system to read all analog pins of the of the Arduino, and the required digital pins of the Arduino via the Bolt Cloud API. Your system does not require the getAnalogData and getDigitalData functions. You will need to write a function named getGPSData, which will do all the work required to retrieve the GPS data from your GPS module, print the GPS data into a String, and then return the string. Also, as per my understanding, you are using the Hardware serial port of your Arduino to communicate with the GPS module, as such you cannot use it to communicate with the Bolt WiFi module. 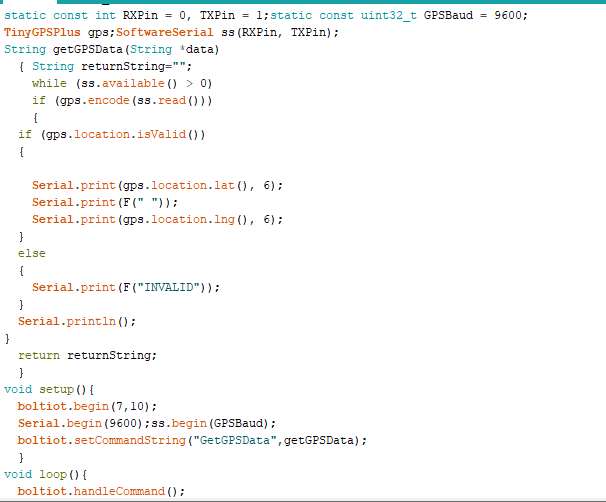 @vinayak.joshi I have attached the screenshot of the arduino code . I have made the changes according to my understanding.But still I am not getting the output,so please go through the code and help. 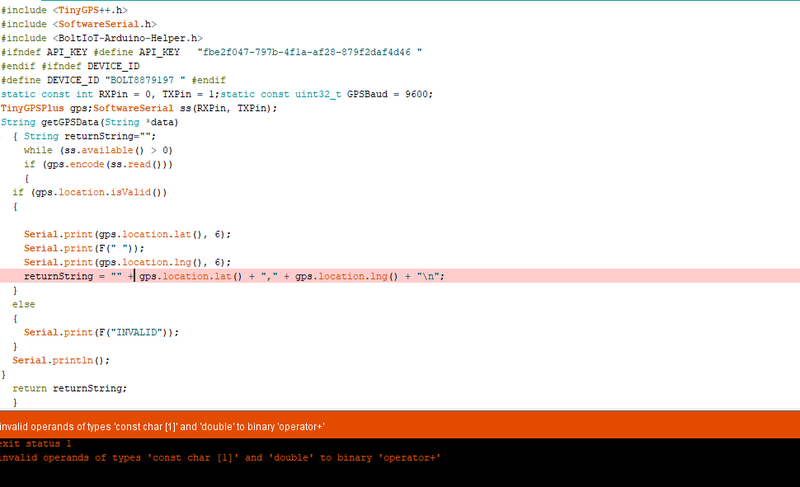 @vinayak.joshi here is the Pythoncode of the BoltIot ,in this i am getting an error in serialRead line saying “argument Missing”. In your code, for the function getGPSData, you are not returning the GPS location via the return string. Apologies for the error in the earlier code. Use serialRead in the following manner, and the issue will go away. @vinayak.joshi I tried the commands that you sent.However I am getting an error in the program,I have attached the program so please go through it. Text requesting personal information has been moderated. @shivamishra97 : It seems I will need to replicate your code on my end. Could you share your code for Arduino here, in text format. If I have to implement your code right now, I will have to type out everything myself, and there may be a situation that I may not copy your code perfectly. #ifndef API_KEY #define API_KEY   "fbe2f047-797b-4f1a-af28-879f2daf4d46 "
Please make the following change in the code line that I had shared with you earlier. I was able to compile the code at my end. Unfortunately, I do not have a GPS with which I could test out the code. Do try out this solution. @shivamishra97 The error is because you have not specified the data param of the mybolt.serialWrite() function. I think the serialWrite() function takes some string data to be passed to the Bolt. The line should make use of response and not serialWrite().